The famous Inca road network, the Qapac Ñan, was a major road system integrating what are today Ecuador, Peru, Bolivia, and the North of Argentina and Chile. This system was the spinal column of the empire, with Cusco, the capital of the Inca Empire at its center. Traversing the Andes and reaching heights of over 5,000 m (16,500 feet) above sea level, the Inca road system covered approximately 22,500 km (14,000 miles) and provided access to over three million km² of territory. Because the Incas did not make use of the wheel for transportation, the trails were used almost exclusively by people walking, sometimes accompanied by pack animals, like the llama. 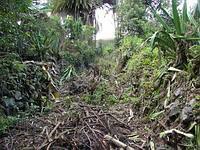 The trails were used by the Inca people as a means of relaying messages and for transporting goods. Messages could be carried by chasqui runners, working in relay fashion. There were approximately 2,000 inns, or tambos, placed at even intervals along the trails. The inns provided food, shelter and military supplies to the tens of thousands who traveled the roads. There were corrals for llamas and stored provisions such as corn, lima beans, dried potatoes, and llama jerky. Along the roads, local villagers would plant fruit trees that were watered by irrigation ditches. This enabled chasqui runners and other travelers to be refreshed while on their journeys. 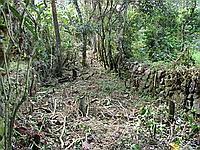 With the help of Inca Project volunteers we have been able to recuperate over 1 mile of the Qapac Ñan running into the Antisuyo, one of the four quarters of the Inca Empire, also known as the Tahuantinsuyo, land of 4 quarters. Because of our location in the heart of the cloud forest and the good relationships we build up with the locals, our team has successfully investigated and recuperated this piece of history. Hard work, but very rewarding and a good combination with the explorations of the newfound site of Cochapata and the community work in the area. Recently volunteers have also discovered a stone cutting site were the Incas had worked. Jhon Valencia, our archaeologist, has his work cut out for him as volunteers seem to find new ruins every week. Volunteers are also about to undertake two expeditions to the Lauramarca mountain from where a trail supposedly leads to Machu Picchu, who knows what these expeditions may reveal.